The University of London (UoL) has confirmed that the transfer date for employees currently working for Health Education England (HEE) under UoL contracts, is 1 August 2019. This decision was apparently made following “an exchange between the vice-chancellor and HEE”, the content of which IWGB has asked to see. Many of the union’s in-depth legal and financial questions remain unanswered, and its representatives will continue to pursue these as well as explore possibilities of legal action relating to the process. We will of course keep you posted as to developments. 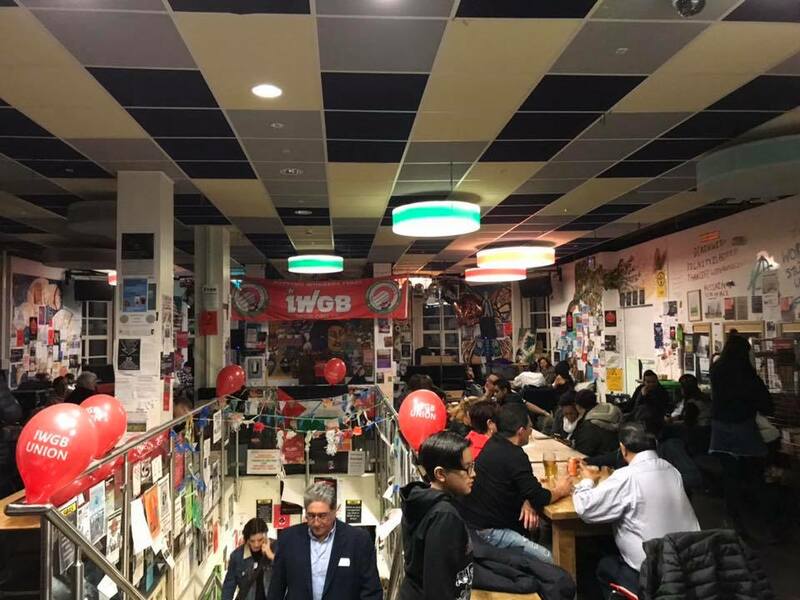 The big launch of the IWGB union’s activities centre for Spanish speakers was carried out with great success this Saturday (18 February), which included, employment law workshop, Brexit, legal clinic, language exchange and bingo. Thanks to all the people who attended the event to get informed, and share a moment of companionship, and fun. 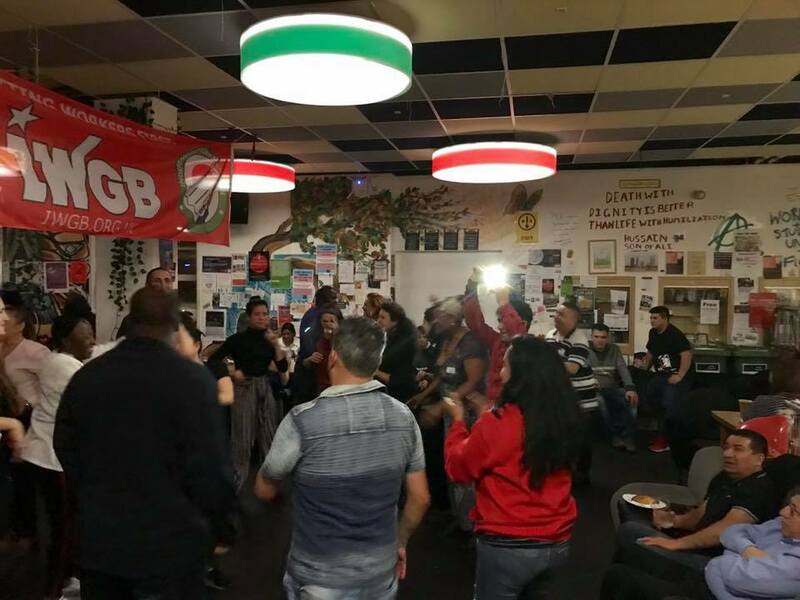 These events will take place every two weeks on Saturdays at Elephant and Castle, which include legal clinics of employment rights and language exchange. The next event will take place on 2nd March from 12.30–3pm to which everyone is invited. During the week, we will be giving more detailed information about the workshops and the topics to be given. Con gran éxito se llevo a cabo el lanzamiento del centro de actividades para hispano hablantes del sindicato IWGB este dia sabado, el cual incluyo taller de leyes laborales, salida del Reino Unido de la Union Europea (Brexit), clinica legal, intercambio de lenguaje y bingo. Gracias a todas las personas que asistieron al evento para informarse y compartir un momento de compañerismo y diversión . Los eventos tendran lugar cada dos semanas los dias sabados en Elephant and Castle, los cuales incluyen clinicas legales de leyes laborales he intercamibio de lenguaje. El proximo evento tendra lugar el proximo sabado 2 de marzo de 12:30 – 3pm al cual todos estan invitados..
Durante la semana estaremos dando información mas detallada acerca de los talleres y temas a tratarse. 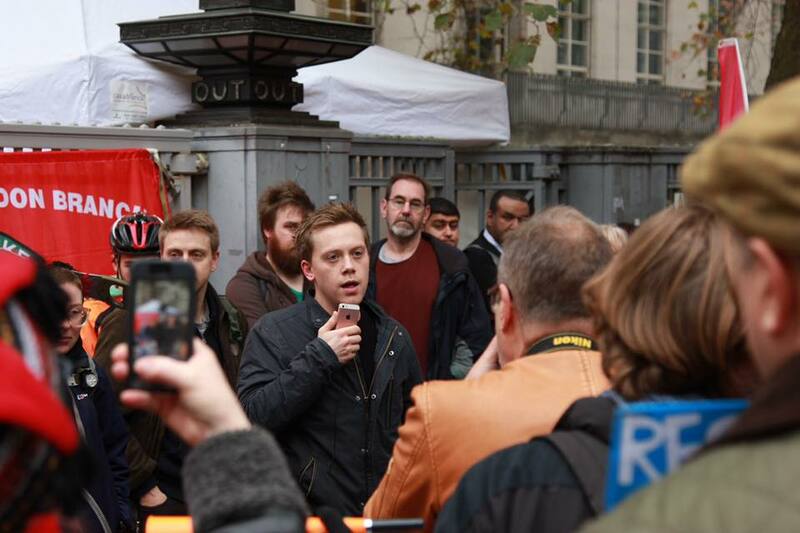 For the first time in UK history, a coalition of unions are coming together in a day of action against outsourcing. The demonstration will take place on 26 February, with marchers starting out at 8am from Senate House, the University of London’s Bloomsbury headquarters. Outsourcing is one of the underhanded methods used by bosses for decades to drive down our employment conditions. By using middlemen in the form of outsourcing companies, employers are able to offer some workers far worse pay, holiday entitlements, sick pay and pension contributions. But the abuse doesn’t stop there. The unaccountable nature of outsourcing companies means workers employed by them are much more likely to suffer from bullying and discrimination. But we are fighting back. For the last few years outsourced workers have been doing what many thought impossible – organising and winning better rights at work. Now we are coming together for the first joint day of action against outsourcing. The demonstration will coincide with the day the IWGB is facing the government and the University of London in a landmark case that turn outsourcing on its head. If successful, the case could open the door for the UK’s 3.3 million outsourced workers to skip the middleman and negotiate directly with their de-facto employer, making it the greatest expansion of employment rights for UK workers in a generation. This landmark national demo against outsourcing is organised by, IWGB, United Voices of the World, Public and Commercial Services BEIS Branch, and the Bakerloo and Finsbury Park branches of the Rail, Maritime & Transport Workers Union. Outsourced security guards at Goldsmiths, University of London have won the backing of the Independent Workers Union of Great Britain (IWGB), which has today launched its campaign to bring them in-house with a letter to the university setting out its demands and next steps. I am writing to you in my capacity as President of the Independent Workers’ Union of GreatBritain (IWGB) on behalf of the security guards who are currently outsourced to CIS Limited at Goldsmiths University. As you are aware, these outsourced workers have far inferior terms and conditions in comparison to directly employed members of staff at Goldsmiths, being treated as second class workers despite providing a vital and important job to without which the University could not function. The only way to end this injustice is to bring these outsourced staff back in house so that they benefit from the same payroll and HR departments, the same maternity and paternity pay, the same pensions, sick pay, and holidays, and the same standards of management as in-house employees. This type of security, decency, and fairness will not be found by using the incompetent contractors you routinely use. 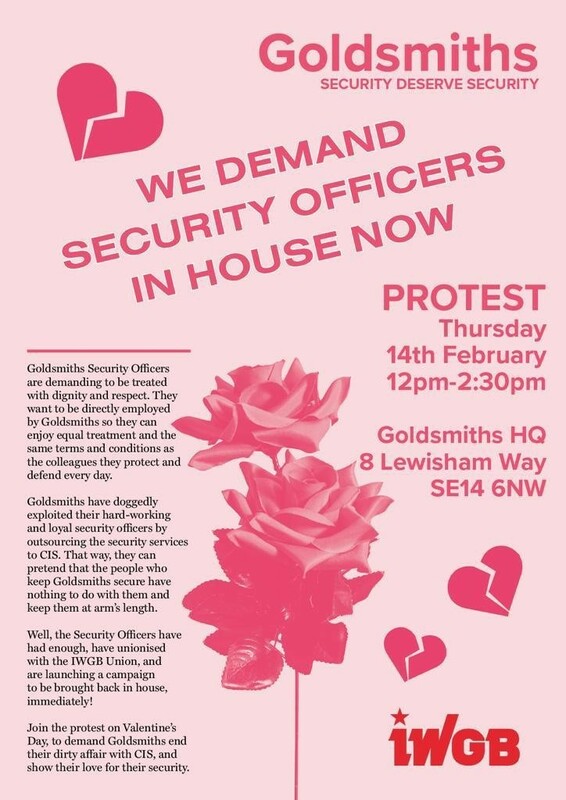 We therefore call on Goldsmiths to take immediate action and bring the security guards in house by no later than 1 February 2019. If the workers are not brought in house by this date, the workers at Goldsmiths are prepared to wage a high profile “Goldsmiths Back In House Campaign”. These workers will have the full support ofthe IWGB in this campaign. We will build support for the campaign among other trade unions, politicians, NGO’s and other organisations. Indeed you can expect public letters from a number of them right after the given deadline calling on you to accept the workers’ demands. We will publicise on social media the ills of outsourcing and the stories of the workers who suffer the consequences of insufficient holiday, sick pay, paternity and maternity pay. We will make and distribute videos where workers and supporters articulate the exploitation of being outsourced at Goldsmiths University. We will be contacting the press to tell them about the two tier workforce at Goldsmiths University, where predominantly BAME migrant workers are on one set of terms and conditions and work without the respect of the University, and another set of predominantly white British workers operate in the same building but a different world. We will be holding loud and disruptive protests. Indeed the first one will be scheduledright after the given deadline if we don’t have a positive response, which should see a few hundred people outside Goldsmiths. The outsourced workers are ready to go on strike over their various demands if needed. We will be flyering Goldsmiths University events to inform the public of the University’s exploitative practices. Write to Goldsmiths donors and famous alumni to inform them of the exploitative working conditions of outsourced workers at the university and highlight the fact that the people who keep the university secure are exploited and treated like second class workers. You and your colleagues may or may not be familiar with the IWGB and the campaigns this union has waged and is currently waging. However lest you have any doubts about the union’s track record on waging and winning campaigns, it might be worth your while to peruse the union’s website, the current campaign at the University of London at Senate House, including the current boycott, and the history and press coverage of the 3 Cosas Campaign at the University of London (http://3cosascampaign.wordpress.com/press- reports/). In closing, I would advise that Goldsmiths not question the determination of the IWGB to achieve justice in this matter. There is nothing that the union treats with more seriousness and urgency than achieving improved wages, terms, and conditions for its members. The workers at Goldsmiths University and the IWGB more generally look forward to receiving your response. The Independent Workers Union of Great Britain (IWGB) is currently looking for a new caseworker to work from its London office for £11.55 per hour, with hours yet to be discussed. The position will be temporary to cover a staff members’ maternity leave. Therefore, the person should be able to start in mid to late January and end on 14 June. undertake any other duties appropriate to the post and help other staff maintain the smooth running of the union’s head office. Have experience of employment-related case work. Grasp the IWGB’s approach and be personally committed to social justice and the improvement of working conditions. Have good computer skills, including a knowledge of MS Office including Excel. Have a high level of personal organisation and an ability to deal with a demanding and stressful job. Have been an active member of a union or have knowledge of the trade union movement. Please email your CV and a cover letter explaining why you feel you would fit this role to Seb Flais at sebastienflais@iwgb.co.uk by no later than 12pm on 10 January. Please also include the details of two professional references. Below is an an update from the ICE forum following the emergency meeting held just before Christmas. Attached are some answers to the questions submitted prior to the meeting, and below is the relevant section from the minutes which provides some more detail as to the proposals and their implications. The university has asked that further questions / response are submitted by the end of the week. The IWGB ICE reps plan to respond that until the issues referred to above are resolved, the process should be halted – but please do send us any additional questions or feedback. Bear in mind that we do not necessarily have to adhere to the university’s deadline! The ICE Forum considered the request from HEE to transfer the services currently provided by University-employed staff to HEE with effect from 1 April 2019, which required the university to release HEE from its requirement to provide 12-months’ notice to exit the Memorandum of Understanding between the University and HEE. SC reported that HEE had formally made its request in mid-November 2018. SC reported that a number of queries raised by Forum members had already been addressed in the confidential Briefing Note that had been circulated prior to the meeting. Any further questions should be submitted, as soon as possible, to ZM for a prompt response. SC clarified that due diligence work would only begin in advance of the TUPE consultation, which itself had yet to start. At that time, the university would consider a number of matters, including its duty to care to staff affected and the potential implications for their pay, conditions and benefits. SC clarified that any decision to review London weighting would not affect staff transferred to HEE. It was also reported that transferred staff would no longer be members of the Senate House Branches of UCU/Unison. However, it was understood that there was a trade union structure in place at HEE. SC clarified that staff, once transferred, would be subject to HEE’s established consultation arrangements. SC reported that, in considering the existing arrangements between the university and HEE, it was estimated that the university would bear a net loss of £150k per year following the transfer of staff. SC indicated that affected staff could apply for vacancies elsewhere within the university. If successful in their applications, they would remain employed by the university. SC noted that the board of trustees, at its meeting on 28 November 2018, had agreed to delegate its authority to the vice-chancellor to respond to HEE on behalf of the university. SC reported that the forum was being asked, at this time, to only provide any further feedback on the request to transfer staff to HEE on 1 April 2019 and that the forum’s feedback would inform the vice-chancellor in his reply to HEE in January 2019. It was reported that the work of HEE was at its busiest from January to March and urged that work on the transfer of staff, which included the due diligence work and the TUPE consultation, should take place during the summer months. TH noted that, in view of the amount of time that the university was taking to carefully consider the impact of bringing back outsourced workers, the university should also adopt a similar approach to this matter and take as much time as it needed. I’m writing to inform you, in case you’ve missed it on Twitter, of our boycott of the University of London (UoL). The boycott, which has already garnered an incredible amount of public support, ranging from the National Union of Students to the co-leader of the Green Party, the Shadow Chancellor, and Ken Loach, will continue until such time as all outsourced workers are brought in house on equal terms and conditions to their directly employed colleagues. Given that we are signing up academics and institutions, I’d also like to invite you to join up. You can do so here. This is a great opportunity for you to get on the right side of history. I appreciate that this may create a logistical conundrum for you as you work at Senate House, but being the progressive and modern institution that UoL intends to be, surely it could make some working from home arrangements for you? Further, when the dust settles on this whole thing, at least you’ll have something to fall back on lest you be accused of presiding over the worst reputational damage in the history of the institution during your very short tenure. Going from awarding Nelson Mandela his distance degree to being boycotted by trade unions, student unions, academics, and leading figures on the British left over unfair treatment of predominantly BME workers is quite a steep fall. Either way, there is and always has been a very easy way out of this mess: bring the workers in house now! 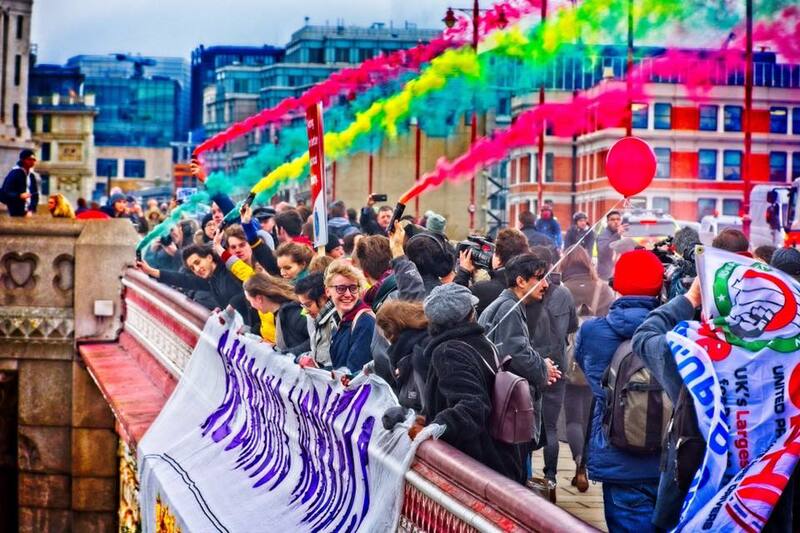 We are over 100 IHR seminar convenors who have jointly signed this letter in support of outsourced workers at the Institute, as we believe that all staff at the IHR – and indeed, across the wider University of London – should be treated equally. While we welcome the IHR’s commitment to make bringing all outsourced workers in-house a priority, we would request on behalf of these workers that the IHR provide a full details of how this process will work, and a commitment (which the workers themselves have been very clear on) that they will all be in house by June 2019. We are particularly concerned about the workers’ position in light of the recent revelation that a senior manager in charge of these staff on behalf of Cordant Services, through whom they are subcontracted, had to be moved from this role after he was found to have shared xenophobic and pro-far right posts on social media. Given that the majority of the outsourced staff are migrant and BAME, we feel that we cannot be assured that they will be treated in a fair and non-discriminatory way until the University of London takes direct responsibility for their employment and working conditions. We obviously treasure our seminar groups’ long association with the IHR, and would want this to continue, and we hope to have your support in ensuring that these seminars take place in an institution where all workers are treated the same regardless of their role. The London Living Wage Foundation is encouraging employers to introduce its new ‘living wage’ rates of £9 an hour across the country and £10.55 in London immediately. Below, Danny Millum requests confirmation from Simon Cain, the University of London’s director of HR services, that the institution’s low-paid workers will benefit from the increase. I am writing on behalf of outsourced workers at the University of London following the recent announcement of the London Living Wage uplift to £10.55 per hour. I just wanted to confirm that this rate would be introduced for all affected staff from the start of November as in previous years. Obviously this is matter of pressing urgency for these low-paid workers, and so I would appreciate if you could get back to me as soon as possible. On 19 October, the University of London (UoL) made public an announcement about its plans to enter a bid process regarding its outsourced contracts. Desperate for clarity, the IWGB representative for the maintenance staff outsourced to Bouygues has written to the university’s senior management team. I am writing on behalf of Bouygues staff employed at the University of London to request clarity regarding recent announcements affecting the contract. The 19 October 2018 intranet announcement stated that the ‘Buildings maintenance contract in house bid to be prepared and tested against external suppliers in 2019′. 1. Who will be covered by this in-house bid? 2. When this will take place? 3. Why a bid is necessary when other workers are being taken directly in-house without going through a process of this sort? In the interests of staff morale is is extremely important to have clear information regarding this issue as soon as possible, so I would appreciate a swift response. 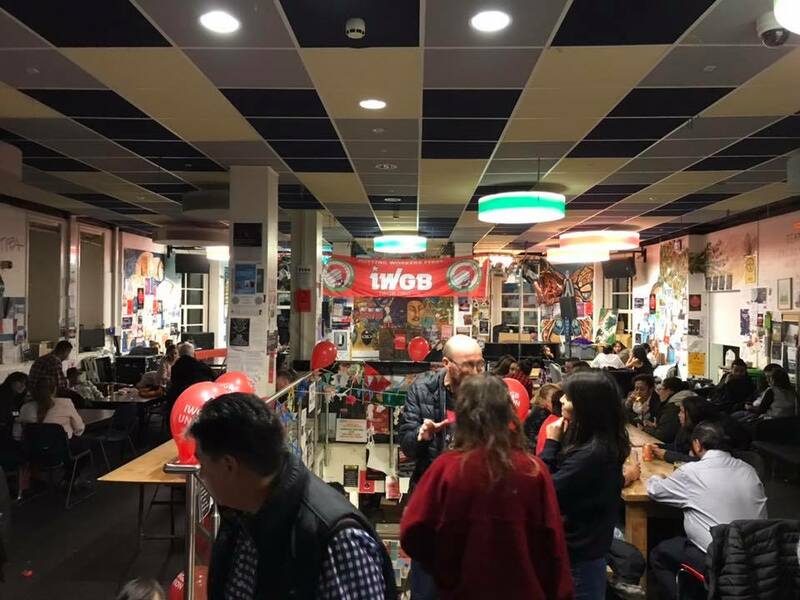 The University of London was the final destination for last week’s ‘Rise of the Precarious Workers’ protest organised by the Independent Workers of Union Great Britain (IWGB). Hundreds of minicab drivers, foster care workers, electricians, couriers, cleaners, security officers and supporters took over the streets of London in what was Britain’s largest march by precarious workers. It was timed to coincide with the latest round of the union’s court case against Uber over worker status for its drivers. The march also serviced as another strike by outsourced workers at the University of London as they fight to be brought in-house in the face of the continued stalling by the institution. The university’s latest position is for a few (overwhelmingly male) workers to come in-house next year, Meanwhile, cleaners, caterers and other outsourced workers are left in limbo. These brave men and women have vowed that until they receive confirmation of an end to outsourcing by June 2019 (almost two years after the campaign began) they will continue to escalate their struggle! A number or organisations, politicians, academics and other trade unions are solidly behind IWGB and its members. Even the media has shown sympathy for the plight of these precarious workers and the protest was extensively covered in the national and local media including the Guardian and Evening Standard. Also see Momentum video here , and photos from the the day here. Calling all IWGB members. We urgently need your help with next week’s strike / march / demo. On Tuesday 30 October, we are doing the same as last year (except hopefully bigger) and combining an outsourced worker strike at the University of London (as part of the in-house campaign) with the Uber tribunal appeal (as well as other stop-offs) so that we can maximise numbers and make as big an impact as possible on each employer. See full details here. In order for this to be successful we need the support of as many UoL people as possible. It would be fantastic if you could lend your support by taking the morning off work, or even just come in late. We’ll be assembling at TFL (197 Blackfriars Road, Southwark tube) at around 8-8.30am. If you have any questions please email dannymillum@iwgb.co.uk. As a result of this we will not be holding the monthly branch meeting scheduled for 31 October. Anyone who was planning to come to this, should join the march instead where we can hopefully cover some informal union business there! Over the next few weeks, BBC’s Newsnight programme is running a series of episodes looking at how to ‘fix’ some key areas of our changing economy. Last night (22 October), it focused on the so-called ‘gig’ economy. During the segment, a roving reporter spoke to a range of people who have to cope with precarious pay and worker rights, as well as Dr Jason Moyer Lee, general secretary of the Independent Workers’ Union of Great Britain (IWGB). He spoke about the gig economy in general and Uber’s policy and business model in particular. The whole Newsnight programme is available here until 20 November. The segment on the gig economy starts at 28:00, while Jason’s interview is from 31:55 to 32:45 and from 36:28 to 37:13.